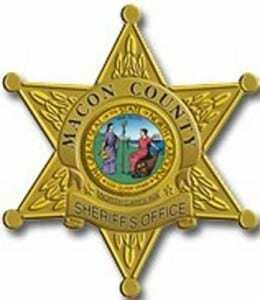 The Macon County Sheriff’s Department, Franklin Police Department or Jackson County Sheriff’s Department made the following arrests August 15 – 23. All suspects are innocent until proven guilty in a court of law. Colton Lee Smith, 27, was charged with failure to appear for unsupervised probation violation. A secured bond of $1,500 was set. Mike Langley Sr. made the arrest. Traci Lynn Fort, 49, was charged with fraud for obtaining money/property by false pretense, larceny, possessing stolen property. An unsecured bond of $3,500 was set. Jonathan Phillips made the arrest. Patricia Anne Morgan, 35, was charged with failure to pay child support. A $250 bond was set. Mike Langley Sr. made the arrest. Brian Lee Mashburn, 29, was charged with communicating threats. No bond was set. Matthew W. Bowman made the arrest. Adam Blake Jenkins, 30, was charged with breaking and/or entering, larceny after breaking and entering, obtaining property by false pretense, forgery of instrument, forgery using/uttering. A $4,000 bond was set. Anthony Zari made the arrest. Al Ledford, 78, was charged with sexual battery. A $2,000 bond was set. Jonathan Phillips made the arrest. Kevin Peter Tilot, 56, was charged with communicating threats, simple physical assault. An unsecured bond of $2,000 was set. Mike Langley Sr. made the arrest. Carl Drew Sileo, 45, was charged with communicating threats. An unsecured bond of $1,000 was set. Mike Langley Sr. made the arrest. Harold James Harrison, 33, was charged with failure to pay child support. A $2,253 bond was set. Mike Langley Sr. made the arrest. Tilmon Gene Fortner, 48, was charged with larceny of a motor vehicle, possession of a stolen motor vehicle, conspiracy to commit felony larceny, failure to appear for harvesting ginseng during a closed season. A secured bond of $6,000 was set. Mike Langley Sr. made the arrest. Gail Lloyd Cox, 68, was charged with injury to personal property, trespassing. An unsecured bond of $1,500 was set. Mike Langley Sr. made the arrest. Seth Odell Williamson, 23, was charged with assault and battery. An unsecured bond of $1,500 was set. Mike Langley Sr. made the arrest. Deborah Roebuck, 44, was charged with second degree trespassing. A secured bond of $500 was set. Audrey Parrish made the arrest. Lance Edward Hughes, 37. was charged with driving while license revoked. A $1,000 bond was set. Mike Langley Sr. made the arrest. Anthony Mark Holloway, 51, was charged with contempt of court, perjury, court violations. A $5,598 bond was set. Chris Owen made the arrest. Grayland Kennell, 60, of West Deep Creek, Bryson City, was charged with larceny, possession of stolen property, trespassing. An unsecured bond of $3,000 was set. Jonathan C. Bean made the arrest. Patricia Ann Geiger, 35, of Ruby Mine Rd., was charged with identity theft, obtaining property by false pretense. A secured bond of $2,000 was set. Jonathan C. Bean made the arrest. Kimberly Sure Dowdle, 30, of Franklin, was charged with unauthorized use of a motor vehicle, possession of methamphetamine. A secured bond of $1,000 was set. Timothy J. Lynn made the arrest. Daz Ryan Heaton, 28, of Countryside Dr., was charged with possession of a schedule II controlled substance, possession of drug paraphernalia, carrying concealed weapon. A secured bond of $1,500 was set. Matt G. Pellicer made the arrest. Everado C. Garcia, 23, of Pressley Rd., was charged with driving while intoxicated for alcohol, no operators license. An unsecured bond of $1,500 was set. Ellija D. Kirkland made the arrest. Brett Charles Aldrich, 43, of Rolling Hills Dr., was charged with larceny/remove anti shoplifting device. A secured bond of $1,000 was set. Jonthan C. Bean made the arrest. Val Gene Hamilton, 36, of Mountain View Rd., was charged with simple physical assault. A $1,000 bond was set. Celestine A. Holloman made the arrest. Tyler Ray Woodard, 21, of Donnie Cochran Rd., Bryson City, was charged with larceny. No bond was set. Ernest A. Scherman III made the arrest. John Riley Harrison, 33, Kinsler Rd., Blythewood S.C., was charged with failure to appear for driving while impaired, open container. A $5,000 bond was set. Celestine A. Holloman made the arrest. David Hunter Creson, 21, of Moonshine Creek Trail, was charged with simple assault on a female. No bond was set. Celestine A. Holloman made the arrest. Tyler Ray Woodard, 21, of Donnie Cochran Rd., Bryson City, was charged with probation violation. Andrew J. Parker made the arrest. Harvey Douglas Bumgarner, 31, of Fisher Creek Rd., was charged with possession of stolen goods/property, obtaining money/property by false pretense. No bond was set. Kenneth D. Woodring made the arrest. John Edward Bradley, 42, of John Taylor Rd., was charged with misdemeanor probation violation. A $30,000 bond was set. Kenneth D. Woodring made the arrest. Dennis Brandon Shuler, 43, of Old 4 Rd., Cherokee, was charged with failure to appear for no liability insurance, fictitious/altered title/registration card/tag. A $750 bond was set. Ridge Aa. Parris made the arrest. Birda Francine Lambert, 30, of Washingtons Creek, Cherokee, was charged with failure to appear for driving while license revoked. A $2,000 bond was set. Ridge A. Parris made the arrest. Dustin Michael Ashe, 38, of Pine Valley Dr., Cullowhee, was charged with sexual battery. A $4,000 bond was set. Kyle P. Efird made the arrest. Rejeana Shelton Watkins, 43, of Johns Creek Rd., Cullowhee, was charged with failure to appear for driving while license revoked not impaired, trespassing, injury to personal property, breaking and entering. A $1,250 bond was set. Ridge A. Parris made the arrest. Milburn Harrison Caldwell, 43, of Beck Branch Rd., Whittier, was charged with failure to appear for driving while license revoked cancel/revoked/suspended/tag. A $2,000 bond was set. Celestine A. Holloman made the arrest. James Michael Kennelly, 27 of Clayton St., was charged with use of social media, failure to change address. A $25,000 bond was set. James L. Clawson made the arrest. Cheryl Dion Cole, 33, of Dragon Fly Ln., Whittier, was charged with misdemeanor larceny, resisting a public officer. A $2,500 bond was set. Lucas T. Brooks made the arrest. Justin Allen Holmes, 31, of Forrest Cove Rd., Cullowhee, was charged with domestic violence protection order violation, trespassing. No bond was set. Austin R. Holland made the arrest. Hassan Almohammadi, 27, of River Walk Apartments, was charged with simple assault. A $500 bond was set. Celestine A. Holloman made the arrest. Brandi Nicole Moore, 22, of Fisher Creek Rd., was charged with possessing/concealing stolen property, drug violations for possession of a scheduled VI controlled substance, drug violations for equipment/paraphernalia using, drug violations for maintaining a dwelling, drug violations for possession of methamphetamine. A $12,000 bond was set. Andrea M. Green made the arrest. Marilyn R. Mull, 50, of Arrow Wood Rd., was issued an order for arrest for obtaining property by false pretense, identity theft. A $25,000 bond was set. Scott B. Walters made the arrest. Kevin George, 47, of Hallmark Ln., Whittier, was charged with assault on a female. No bond was set. Austin R. Holland made the arrest. Tonya Lynn Maney, of Bertha Saunooke Heights, Cherokee, was charged with possession of drug paraphernalia, possession of methamphetamine. A $5,000 bond was set. Brandon D. Hooper made the arrest. Nigel Holmes Ledford, 20, of Bradley Rd., Cherokee, was charged with possession of drug paraphernalia, possession of methamphetamine. A $5,000 bond was set. Brandon D. Hooper made the arrest. Mitchell James Ledford, of Bradley Dr., Cherokee, was charged with possession of drug paraphernalia, possession of methamphetamine. A $5,000 bond was set. Brandon D. Hooper made the arrest. Kala Marie Bueno, of Caney Fork Rd., was issued a warrant for arrest for misdemeanor stalking. A $4,000 bond was set. Scott. B. Walters made the arrest. Amber Nicole Simon, 22, of Caney Fork Rd., was issued a warrant for arrest for misdermeanor stalking. A $4,000 bond was set. Scott B. Walters made the arrest. Christopher Jason Kent, 28, of Dahlia Dr., Whittier, was charged with intoxicated and disruptive. A $1,000 bond was set. Andrew J. Parker made the arrest. Brady Lee Fortner, 21, of Poker Branch, was charged with simple assault. No bond was set. Brandon D. Hooper made the arrest. Juan Rincon, 29, of Derby Rd., Cullowhee, was charged with assault on a female. No bond was set. Brandon D. Hooper made the arrest.